BETA. This application is still under active development. 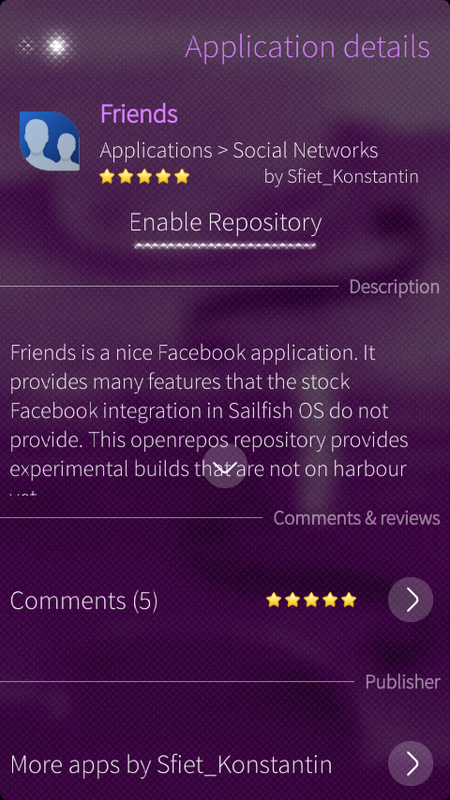 Warehouse is not yet compatible with SailfishOS version 2.1.4 or above. Use Storeman as OpenRepos client application. 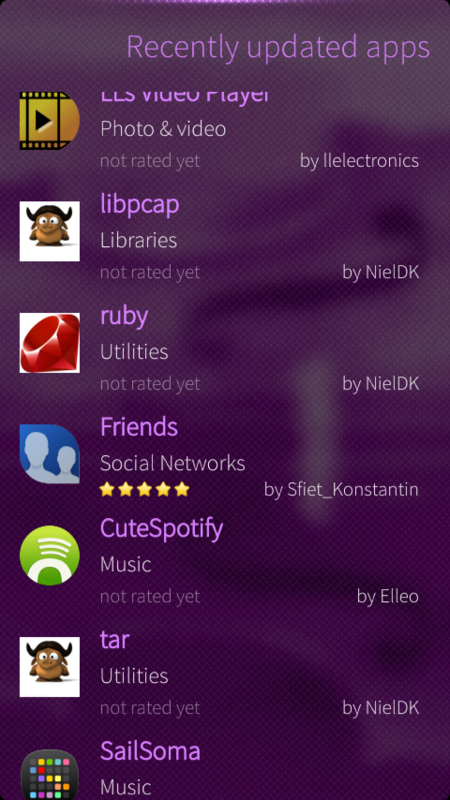 Browse and install applications, enable repositories. Just download and tap to install. If warehouse does not start after upgrade, uninstall warehouse, and install latest version. Emergency fix for category API change. After upgrading my Sony to SailfishOS 2.1.4.14 (Lapuanjoki) the Warehouse App is gone an not installable (latest version.) Any idea? Did I miss an update or is warehouse still not working? 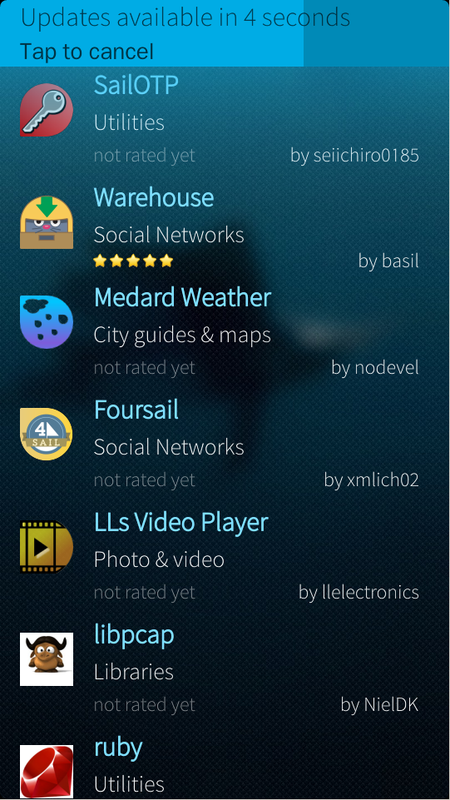 Warehouse is not yet compatible latest 2.1.4 sailfishos release. Yes, they change packagekit/packagekit-qt api/abi and there will be no backward compatibility for existing applications. One of the next SailfishOS updates will obsolete current versions of harbour-warehouse (and harbour-storeman) packages. Okay. Will you update it? How difficult is it expected to be? Should be easy to update. As soon as update hits ea, andn sdk will be available. Dont you have interest on translate it for more languages Basil? I can help (just in case) if you post it on transifex. In the Warehouse app, after checking an app's description, tapping 'check for updates' and then the colored strip on the top, and then going back to the description, the shiny dot 'backward' disappears. Is this fixable? Today I tried to install Warehouse on my Xperia X. After Downloading and tapping the rpm it says: "Problem with installing - harbour-warehouse"
I used the Sailfish image "2.1.1.26" from xda-developers "Sailfish OS on X" and "allow untrusted software" is enabled. I know, this is not the official supported version for the X. Maybe it lacks some packages? I installed zypper from terminal and used the downloaded warehouse file. Maybe. You can use `pkcon install-local file.rpm` or RPM-Installer to get detailed error output. "/home/nemo/Downloads/harbour-warehouse-0.3-30.armv7hl.rpm has wrong architecture: armv7hl"
i download rpm's and when i tap on it, no action happen. what i must to do??? 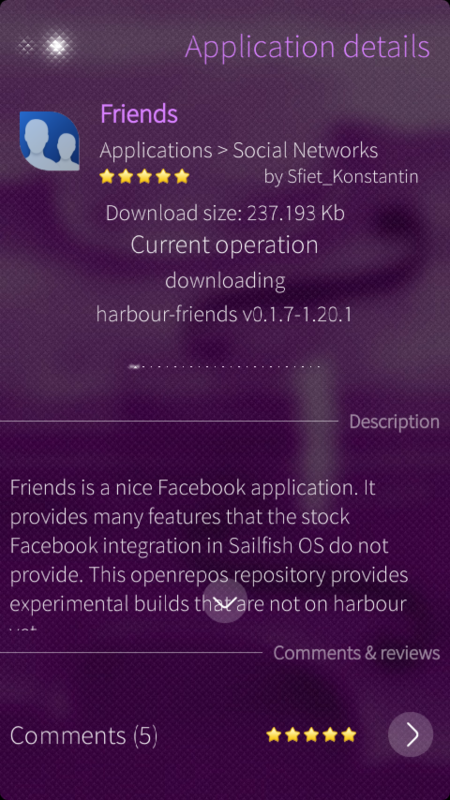 Hi there, you need to enable installation from non trusted sources in sailfishos settings. After enabling, rpm tap will start installation process. Bug: Clearing of input text with the X-symbol does not work. Click on application version and download .rpm file, then tap on rpm file and install it. Whats the difference between delete all blacklisted cookies in cookies tab, and clear blacklist in settings tab? Warehouse does not have such functionality. Irritatin behaviour: upon installing an app for the first time, you get the oldest version available. Expected behaviour (at least from my side) is to get the newest version. This is expected behaviour. You will get version based on local(on your phone) repository cache content. If you just enabled publisher repository, cache will be up-to-date. If you install application from already enabled repository, a known(cached) version will be pulled from repository. This is exactly what I was thinking. I installed warehouse and enabled a publisher's repository for the first time. Then I install the app and got the oldest version. I was expecting to get an up2date copy since I had not used the repository before.